Opinion polls: Do they reflect – or manipulate – Egyptian public opinion? Opinion polling, which often plays a crucial role in the run-up to democratic elections in the West, made an embarrassingly poor attempt at predicting the results of Egypt's first free presidential poll. The eventual success of some candidates, and the modest support for others, came as a surprise to Egyptians who had followed the highly-publicised opinion polls performed by both state-owned and independent media in the days before the 23-24 May elections. 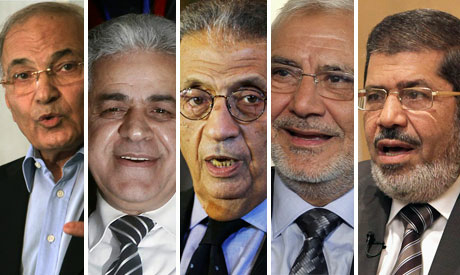 Four major surveys by Al-Ahram's political studies centre, the independent newspapers Al-Shorouk and Al-Masry Al-Youm, and the cabinet's Information and Decision Support Center, all predicted that the two Mubarak-era statesmen, Ahmed Shafiq and Amr Moussa, would take first and second place. In the most damning failure, none of the polls predicted that the Muslim Brotherhood's candidate Mohamed Morsi would place any higher than fourth or fifth. Morsi ended up receiving one quarter of votes cast, and proved the most popular candidate. Perhaps the biggest surprise was the weak showing for Moussa, who served as foreign minister under ex-president Hosni Mubarak. Opinion polls predicted first or second spot for the 76-year old just a week before over 20 million Egyptians cast their ballots. In the end, however, he garnered just 11 per cent of the vote and was lowest placed of the five main candidates. By contrast, Hamdeen Sabbahi – the 'dark horse' of the election who finished in third place with 21 per cent of the ballot -- had been practically dismissed in pre-polling surveys which had put him in either fourth of five place, just behind or before Morsi. Polls also suggested mass support for Abdel Moneim Abul-Fotouh, who received sustained media publicity, and was expected by all but one of the main polls to finish in third place. In the end, the former member of the Brotherhood placed fourth with 17 per cent of the total vote. The surveys were only reliable when it came to one man: Ahmed Shafiq, Mubarak's last prime minister. 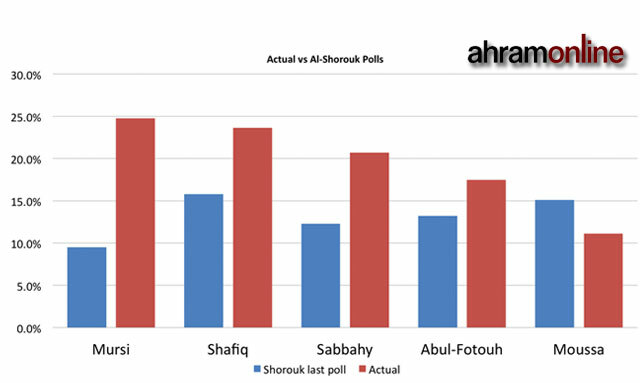 Polls predicted Shafiq would take first or second place, and he did indeed finish as runner-up to Morsi after gaining slightly under a quarter of the total votes cast. 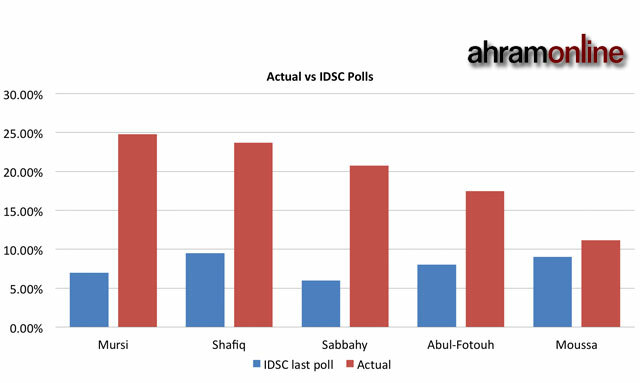 The Egyptian government's Information and Decision Support Center (IDSC) carried out four opinion polls. In its last survey published on 14 May, nine days before the elections, they predicted that Shafiq and Moussa would finish in the top two places and go through to the runoffs. Morsi and Sabbahi were predicted to take fourth and fifth places -- they actually finished first and third, respectively. The IDSC also indicated that a third of voters were un0decided about their choice, raising the possibility that voters changed their opinions at the very last moment. This poll predicted a turnout of 84 per cent, far from the actual 46 per cent observed at voting stations on 23 and 24 May. 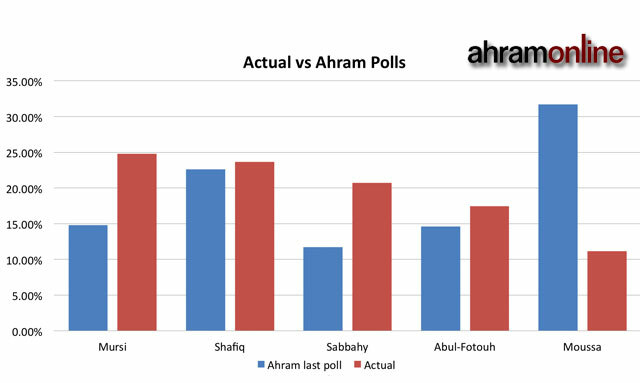 The last poll carried out by the Basira Centre for Public Opinion Studies and published by Al-Masry Al-Youm newspaper on 19 May, also seemed to exaggerate the level of support for Abul-Fotouh and Amr Moussa. Abul-Foutuh received backing from several Salafist groups and was expected to be among the top three candidates. As early results trickled in on Thursday 24 May, it was clear that the former Brotherhood figure was a paper tiger – and that the same went for Moussa. 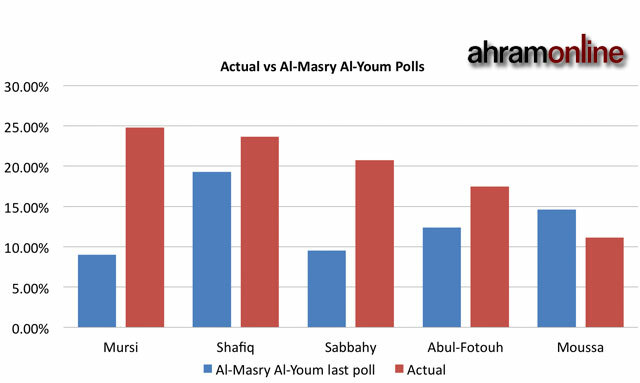 Al-Masry Al-Youm also showed that a third of total voters were still undecided . The Al-Ahram Center for Political and Strategic Studies (ACPS) put Moussa in a comfortable lead with more than 30 per cent of votes. ACPS, however, was right on target when it came to foreseeing a second place for Ahmed Shafiq with a total of 25 per cent of votes. The daily newspaper followed the trend and put the Brotherhood's Morsi in fifth place, grossly underestimating his support. Nearly 30 per cent of voters were still undecided when it made the survey. or people just changed their minds in the last few days.... if you look at the work done by @melhoshy at http://www.ducoht.org/ looking at the results over time you can see the surges for sabahi and morsy. Because people coulsn't read the polls they are saying the polls are wrong. Funny you say that, but you knew they were all dodged.